The Flintstones are your traditional American family that happens to live in the Stone Age. 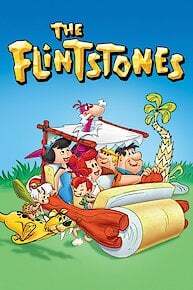 The Flintstones live in the town of Bedrock on Cobblestone Way next to their best friends the Rubbles. The head of the Flintstone household is Fred Flintstone. Fred Flintstone generally wears an orange leopard shirt with a black tie and can be bit of a hothead. Fred works at the Slate construction site as a dinosaur operator, what we now call a crane operator. Fred is married to Wilma Slaghopple, which he met one summer while working at the Honeyrock Hotel as a bellhop. Wilma is a calm headed redhead that is a stay at home mom, taking care of the Flintstone one-story cave house and their infant daughter, Pebbles. The Flintstones have a pet dinosaur called Dino that is very smart, loyal and is very protective of Pebbles. The Flintstones lives next door to their best friends the Rubbles. Barney Rubble has been best friends with Fred they were infants. Barney works hard but unlike Fred is not steadily employed, working at various jobs including repossession. Barney is also an inventor, inventing a super fuel for cars and a helicopter that looks like a flying eggbeater. Barney is devoted husband and father who is madly in love with his wife Betty that he also met at the Honeyrock Hotel working as a bellhop, the same summer that Fred met Wilma. Betty and Barney adopted a son called Bam-Bam, which is the strongest baby in the world. The Rubbles have a pet named Hoppy, which is a hopperue from Down Under. Like Dino, Hoppy is the perfect pet for the Rubbles and is referred to by Wilma as a built in babysitter for Bam-Bam that can come, pick him up, and place him in her pouch to go home after a nice visit with Pebbles. The Flintstones and the Rubbles, being best friends, have had several adventures together. Like the time Fred and Barney helped Fred's rich Uncle Tex catch cattle rustlers on is ranch in Texasrock or the time they went hunting a Snorkasaurus, not to mention the time Fred bought a circus. With adventures like those who wouldn't want to meet the Flintstones and the Rubbles and join in on the fun. Living in prehistoric times has its drawbacks, but the Flintstones and their neighbors survive in style. Will Ferrell has put his name on a lot of projects in the past, like "Anchorman," "Talladega Nights" and even "Funny or Die." But he's about to add another big one: "The Flintstones." The classic cartoon will be rebooted as a new movie under Warner Bros., and Ferrell is attached to the project. If you're wondering, the answer is no, he won't be playing Fred. Everyone once in a while, you read one of those news stories that makes you go "Wha? Huh?" This is one of those stories. Seth MacFarlane, creator of the hit Fox cartoons "Family Guy," "American Dad" and "The Cleveland Show," is reportedly developing an updated version of "The Flintstones" for Fox. That's right, the animated sitcom that started it all back in the 1960's is going to return to TV. The Flintstones is currently available to watch and stream on Other. You can also buy, rent The Flintstones on demand at Amazon Prime, Amazon, Vudu, Google Play, iTunes online.